When did Wi-Fi get so confusing? We all know that Wi-Fi is migrating to 5GHz, but that's about to be exacerbated by the arrival of LTE-U. But what of HaLow, 802.11ad, 802.11ax, 802.11ay, WiGig, LPWAN and MU-MIMO? Why are Intel, Peraso, and Qualcomm all focusing on 802.11ad? Mostly it's about improvements in efficiency, range, and power consumption, but here's our guide to Wi-Fi, how it's changing, and what it means for IT – and the IoT. The IEEE 802.11 family of LAN standards is what we know as Wi-Fi. Recently Wi-Fi routers have been moving from 802.11n to the latest 802.11ac Wi-Fi standard, with the number of speed increasing antennas multiplying, too. The last few years have also seen printers, cameras and smart home devices using Wi-Fi Direct, an ad-hoc P2P network that peaks at 250Mbps. However, the real evolution in Wi-Fi routers of late has been the choice of using either the 2.4GHz and 5GHz spectrum in homes, with so-called '2G', the former, being the original flavour of Wi-Fi. 2G is crowded but offers better coverage than '5G', which has a shorter range but higher data rates. So 2G is great for using when you're in the attic far from the router, and 5G is best for when you're close to it and want to download a movie. Routers that offer 2G and 5G are everywhere, but there's a lot more to Wi-Fi's future. What is AC5400, AC5300, MU-MIMO and 802.11ax? 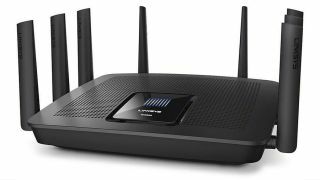 2016 has seen a few so-called 'tri-band gigabit' 802.11ac Wi-Fi routers. Although these promise between 5,300Mbps to 5,400Mbps per second – hence the use of two informal names, AC5300 or AC5400 – this is actually just the addition of an extra 5GHz channel to the regular dual-band routers. As such, this innovation is about added convenience to existing tech, not something radically new. Incoming models include the Linksys EA9500 Max-Stream and Asus RT-AC5300, both of which also include MU-MIMO, which stands for Multiple User, Multiple-Input, Multiple-Output. Recognising that modern homes are clogged with myriad devices all vying for bandwidth – especially video streaming – MU-MIMO shares that bandwidth equally and is expected to become a default feature on Wi-Fi routers of the future. Much more exciting is the prospect of Wi-Fi routers with 802.11ax. Now under development and primed for launch in 2019, 802.11ax has been shown to offer 10Gbit/s while still operating in the 5GHz band. ABI Research forecasts that 802.11ax will account for 57% of Wi-Fi chipsets by 2021. So 802.11ax is the 'next normal' for Wi-Fi routers. What are 802.11ad and WiGig? These are exactly the same thing. WiGig (short for Wireless Gigabit) is premium Wi-Fi, using the unlicensed 60GHz spectrum to deliver astonishingly fast speeds of up to 7Gbps via four 2.16GHz bands. As such the gigabit Wi-Fi offered by WiGig is perfectly suited to the 5G era, when Full HD and 4K video will be created and uploaded by smartphones. Whether 5G or WiGig is being utilised won't make much difference to the user, which is the point behind WiGig; seamless data transfers of uncompressed video wherever you are. Its 5G tie-up means WiGig won't be seen for a few years yet, though trials are underway. TP-Link, NetGear and Elecom all demoed WiGig routers at CES 2016, while Peraso just showed off the first WiGig USB dongle at Computex 2016. Expect WiGig access points, networking adaptors and, eventually, tablets, smartphones and laptops. ABI Research estimates that by 2018, over 600 million WiGig chips will be sold annually. Also on the horizon, as an enhancement to WiGig, is 802.11ay – it works at 60GHz and offers as much as 20Gbit/s, though it can only work at very short range. Could Wi-Fi be replaced by Li-Fi?